Innerchoice Publishing Blog – Page 4 – Bringing Emotional Intelligence to Life. 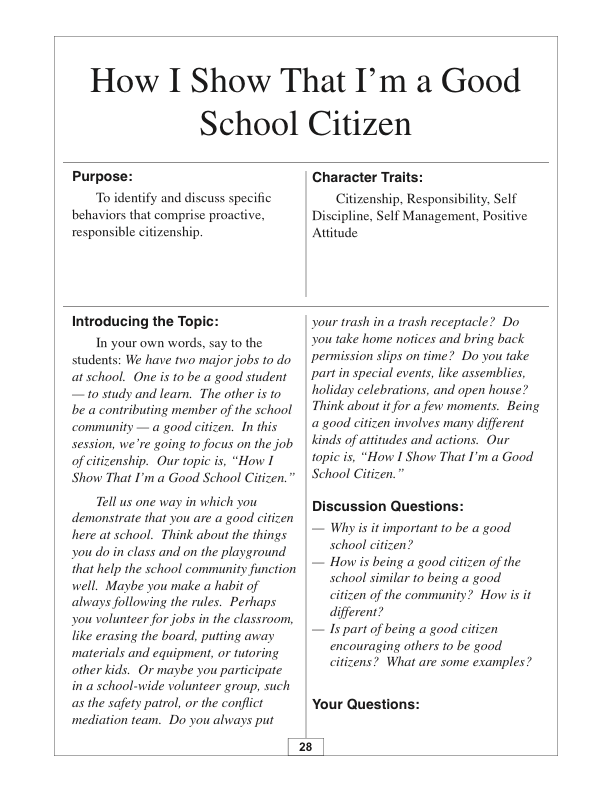 To identify and discuss specific behaviors that comprise proactive, responsible citizenship. — Why is it important to be a good school citizen? — How is being a good citizen of the school similar to being a good citizen of the community? How is it different? — Is part of being a good citizen encouraging others to be good citizens? What are some examples? We All Need To Be Getting Along! What does it take for people to get along? What is required for individuals and groups from diverse backgrounds to willingly seek common ground while respecting and proudly maintaining the sundry paths that brought them to the places they share? Our multicultural society is made up almost exclusively of immigrants and the descendents of immigrants, many of whom arrived on these shores seeking religious tolerance and freedom from oppression. What ethics must we nourish in our children, what skills do our youth need to learn in order to appreciate the brilliant kaleidoscope of colors and cultures they have inherited? How can we get them to honor, enjoy, and protect what increasing numbers would shatter and separate into little piles of hues and textures with jagged, hostile edges? We can start by recognizing that a school is a community and the classroom a smaller community, and that whatever happens here not only goes home, but to the theater, the mall, the library, the park, the athletic event, and the religious service. Children must grasp that in order for any of us to truly enjoy and benefit from the amenities and opportunities that are available in the community, in order for any of us to feel entirely safe and secure, in order for any of us to expect optimal conditions for learning and growth, we must ensure that those same benefits, securities, and conditions are available to all of us. In short, we must learn to get along. We don’t always have to agree. We can expect to have different ideas, different values, and different goals, but we must learn to respect one another’s rights, to work and play cooperatively, to resolve conflicts, and to take responsibility for our own behaviors and the effects those have on others and on the community as a whole. Merely admonishing students to be “good citizens” is not enough. Most are very familiar with the label and can readily parrot all the implied expectations. For students to get along in the deeper sense characterized by true interdependence, they have to develop self-awareness; undertake responsibility for their actions; accept and appreciate differences in others; listen with empathy and understanding; communicate their thoughts and feelings accurately and assertively; include others in their activities; be open to divergent styles and points of view; work together to solve problems and complete projects; and peacefully resolve any conflicts they experience along the way. What’s more, they have to be conscious that they are doing these things, and be able to verbalize the reasons and benefits. To develop competency in these areas involves the acquisition of specific skills, along with growing awareness and open discussion concerning the process. This in turn requires not just explanation, but modeling, plenty of practice or behavioral rehearsal, and ongoing dialogue. The activities in GETTING ALONG – Social Skills Activities for Middle and High School Students are designed to introduce students to these skills in a deliberate, enjoyable fashion and, in the process, elevate their awareness of the responsibility that each has to make the classroom and/or school a cooperative environment where everyone is included, where people experience true interdependence, and where dissent and conflict are never fearsome or ugly but, rather, natural and productive. Today’s selected activity, Promoting Inclusion, comes from the unit “INCLUDING OTHERS”. — identify specific words and actions that create good feelings in others. — accept credit for good and kind deeds. — explain how acts of kindness benefit themselves and others. Today’s topic is a very broad one that can be discussed in many ways. It is, “Something I Did to Make Someone Feel Good.” You see what I mean? You have probably done hundreds of things to make other people feel good. Just tell us about one. 1. How do you feel when you know you’ve made someone feel good? 2. Usually, when a person feels good, everyone who comes in contact with that person benefits. Can you explain how that happens? 3. If everyone in our group tried to make one extra person feel good each day, how would our group benefit? Scientific research into learning and the human brain is currently exploding with discoveries about how humans learn best. It’s now widely recognized that neuroplasticity (the ability of the human brain to grow, learn, and change throughout life) can, and should be, positively enhanced by schooling. Compelling evidence suggests that if educators understand how the brain learns and implement the correct skill-building educational experiences, all students can experience success. This current research explosion has made it apparent that physical movement is critical to learning. Voluntary large motor activities such as games, team sports, dance, and running raise the good brain chemicals needed for learning, focus, thinking and memory access, and also help to reduce stress. Since chronic, acute stress negatively impacts learning and behavior, providing regular physical activity becomes a natural de-stressor and an important part of any school day. Research suggests that students benefit from 30 to 60 minutes per day of movement and organized physical activity. Pro-social games of all kinds offer additional important ways to purposefully promote social and emotional learning. The natural desire of children to play together and have fun makes games an ideal delivery system for teaching important life skills. Through the structure, rules, and social interaction of games, children learn to share and take turns. They practice self-control and the effective management of negative emotions. They learn that motivation and persistence pay off. Games teach children the benefits of interacting with others in fair, just, and respectful ways, and help develop the critical life skills of collaboration and teamwork. These important social and emotional skills are not innate talents, but learned abilities. The acquisition of social-emotional skills is facilitated by the structure and rules of games, by peer interaction, and also by adults modeling these behaviors and helping students to make appropriate learning connections. Today’s selected activity comes from the unit “GET-ACQUAINTED GAMES” in our book, EVERYBODY WINS! – 100 Social-Emotional Games That Children Should Play. The games in this section were selected because they encourage self-disclosure and sharing in the non-threatening context of play. They can be used to help students become better acquainted, to promote inclusion, to build team cohesiveness, or as preludes to more challenging tasks. Players introduce themselves to one or more persons, focusing on the value of each individual and acknowledging similarities and differences. Use this activity now, and purchase the book to have a whole library of instantly usable games to engage your students. 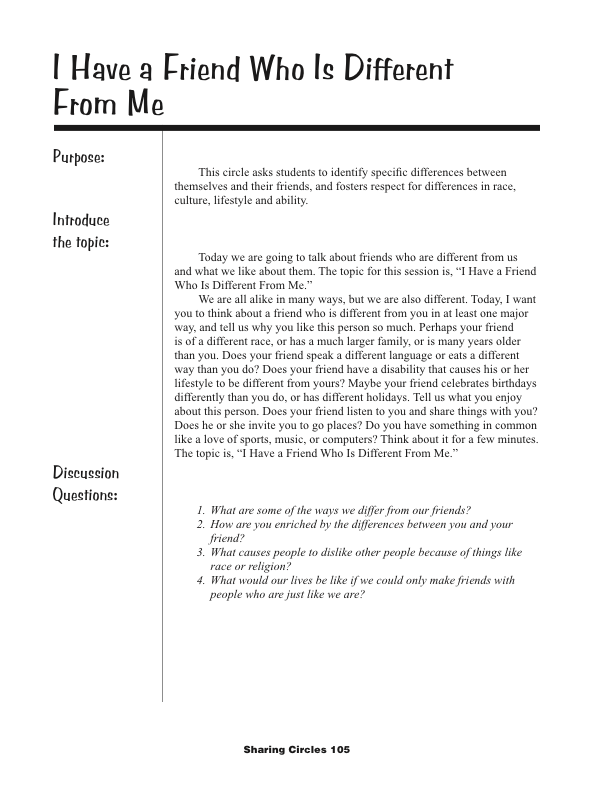 This circle asks students to identify specific differences between themselves and their friends, and fosters respect for differences in race, culture, lifestyle and ability. 1. What are some of the ways we differ from our friends? 2. How are you enriched by the differences between you and your friend? 3. What causes people to dislike other people because of things like race or religion? 4. What would our lives be like if we could only make friends with people who are just like we are? What does it take for young people to be college and career ready? Today’s students will need to succeed and lead in a highly competitive global economy, a knowledge-based society and a hyper-connected digital age. It’s no longer enough to just be trained in technical skills. Today’s workers need interpersonal and relationship skills. They need to know how to communicate and collaborate. In short they must develop a full spectrum of life skills which provides the foundation for success in college, career, at home and in the community. By developing these skills in your students now you’ll be promoting their college and career success. 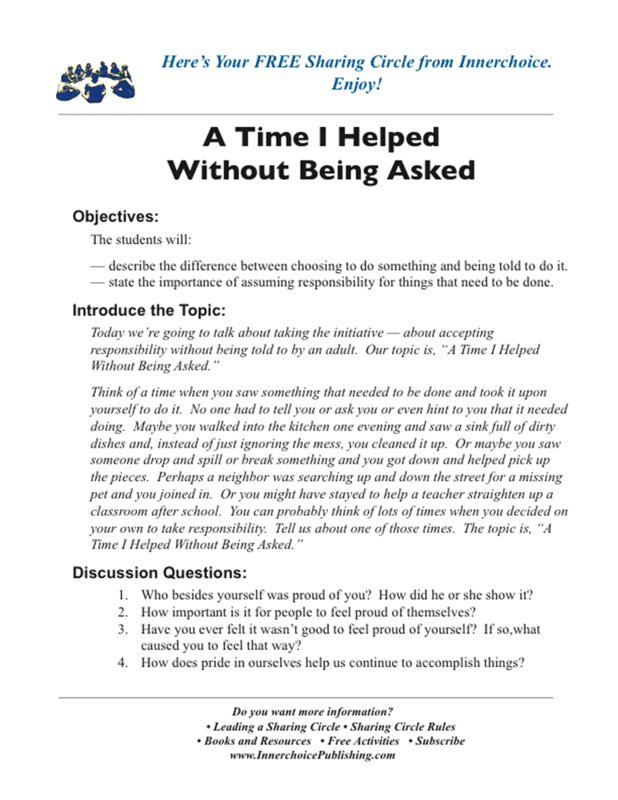 Here is a goal setting activity and reproducible student activity sheet from Preparing Students for Success and Leadership in College and Careers. Use this activity now, and purchase the book to have a whole library of instantly usable activities to engage your students in preparing for their lifetime of success. You can check the book out HERE, and you can open a reproducible PDF of your student experience sheet HERE. — describe the difference between choosing to do something and being told to do it. — state the importance of assuming responsibility for things that need to be done. 1. How did you feel when you helped without being asked? 2. How would your feelings have been different if you had been asked, or even ordered, to do the same thing? 3. What does it mean to be a responsible person? 4. Why is it important for each of us to take responsibility for things that need to be done? Effective counseling can have a powerful impact on the ability of all students to learn, and to manage themselves in the classroom, the school, and all other areas of their lives. As counselors, we hold the keys to some of the most vital, sought-after, life-skills that people of any age can develop. In a lifetime, many individuals never acquire these skills, yet we have the power to teach them to children! Not just the children who are referred to us, but all children. Counselors can help students feel comfortable in the school environment, develop positive self-concepts, and rediscover the motivation to learn. We have the ability to enhance open communication and promote cooperative work skills. We can create a renaissance in interpersonal relations by developing listening, speaking, and observation skills, and promoting tolerance and the ability of young people to get along well with others. In addition to training in life-skills, counselors can help students make continuous links between classroom learning and the career futures that await them, and prepare students to deal with change. We can show students the path of responsibility, teaching them to be safe, to resist substance abuse, and to shun violence and bullying. Through our efforts students can develop an entire repertoire of skills associated with problem-solving, decision-making, assertiveness, and conflict resolution. Written especially for counselors, Counselor in the Classroom, offers a collection of learning activities designed to optimally utilize the skills of Counselors and bring those skills into the classroom by integrating counseling and guidance with classroom instruction. In this week’s blog we’ve chosen a Counselor-led activity from Counselor in the Classroom dealing with friendship. You can check the book out HERE, and you can download the activity and student experience sheet HERE. PS: If a friend forwarded this to you, you can just sign up to get your own weekly Innerchoice Publishing Activity Blog. — describe the feelings generated by accomplishments. 1. Who besides yourself was proud of you? How did he or she show it? 2. How important is it for people to feel proud of themselves? 3. Have you ever felt it wasn’t good to feel proud of yourself? If so,what caused you to feel that way? 4. How does pride in ourselves help us continue to accomplish things? Relating effectively to others is a challenge we all face. People who are effective in their social interactions have the ability to understand others. They know how to interact flexibly, skillfully, and responsibly. At the same time, they recognize their own needs and maintain their own integrity. Socially effective people can process the nonverbal as well as verbal messages of others. They possess the very important awareness that all people have the power to affect one another. They are aware of not only how others affect them, but the effects their behaviors have on others. In order to build healthy relationships, children need to have positive interpersonal experiences and to gain information concerning the social realm of life. As a rule, we do not systematically teach children how to understand and get along with other people. However, since social skills are fundamental to success in life, and are learned behaviors, children should be consistently and developmentally taught these important skills. It is important to recognize that people who enjoy effective social relationships are exhibiting not just one ability, but many different skills, each at a different level of development with different nuances of understanding. The activities in Social Skills Activities for the Elementary Grades are designed to help children become aware of the importance of effectively relating to others, and to teach them social interaction skills in a deliberate and enjoyable fashion. For your FREE activity and reproducible student Experience Sheet from the Communicating Effectively unit in Social Skills Activities for the Elementary Grades just check out the link below.